Did you see a Dutch Shepherd somewhere? Out in public? On Television? In a movie? columbiametro.com wrote: Cynthia Waggoner, a sergeant who has been on the City of Columbia’s K-9 team for 10 years, is currently working with her second K-9 partner, Anna, a Dutch shepherd. www.bdtonline.co wrote: To support the Princeton City Police Department’s two K-9 units, toy dogs can be purchased at $15 each. The toys, called K-9 heroes, perfectly depict the two real dogs, Trax and Taz. Trax, a tan bloodhound, and Taz, a brindle Dutch shepherd, proudly serve Princeton through all of their law enforcement duties. www.thecabin.net wrote: Officer Brittany Byrd comes from a law enforcement family. Fighting crime is part of who she is, and now she is also the Conway Police Department’s first female K-9 handler. Leo is a one-and-a-half-year-old Dutch Shepherd who trained at the Little Rock K9 Academy. www.cordeledispatch.com wrote: Melody Godfrey and the staff at COUNTRY Financial in Cordele donated $1,500 to the Crisp County Sheriff’s Office at a check presentation ceremony on Tuesday. The funds will go toward the purchase of body armor for one of the county’s newest deputies. t’s not your average set of body armor, though, because the new deputy who will wear it is K-9 Deputy Molly (A two-year old Dutch Shepherd). And Deputy Molly is not your average K-9. www.kvue.com wrote: Those dogs include two Labrador Retrievers, one Dutch Shepherd and two Belgian Malinois. 5 - K9s (At least the way I do math). CORRECTION - apparently the quoted paragraph was describing K9s that graduated last November. What I don't understand is why detail that but not the new graduates? www.mantecabulletin.com wrote: It has been 10 years since Ryan Biedermann lost his K9 partner Niko on the job. And not a day goes by that he doesn’t think about the seven years that he spent with the Dutch shepherd by his side – a good chunk of that time spent in Lathrop on patrol. wgxa.tv wrote: Molly, a Dutch Shepherd, will play a crucial part in making sure the deputies stay safe, according to Sheriff Billy Hancock. www.theepochtimes.com wrote: K9 Officer Greg Shone was on duty that night with his partner, Titan, a 4-and-a-half-year-old Belgian Malinois. As the team searched the area, the suspect panicked and fired a gun, and Titan caught a bullet. 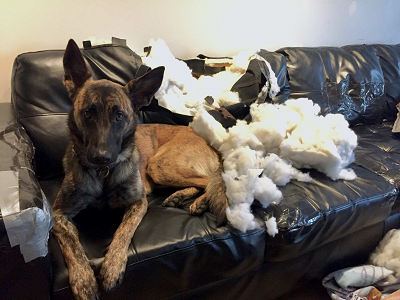 www.thegazette.com wrote: Xena is a Dutch shepherd certified in drug detection, handler protection and tracking, according to a May 2019 Facebook post by the police department. www.loganbanner.com wrote: Captain J.T. Adams, one of the most certified, qualified and trained law enforcement officers in Boone County, is the caretaker, friend and partner to Rival, a playful and extremely intelligent 6-year-old Dutch Shepherd. www.montrosepress.com wrote: Sheriff Gene Lillard, who in January said he would reinstitute the K9 program for the agency, on Monday announced the acquisition of “Tigo” (pronounced TEE-go), a Dutch shepherd. Tigo is now completing training with his handler, Sgt. Chuck Searcy, in Ogden, Utah. www.counton2.com wrote: "By having great connections, our Chief was able to get Gracie, a 6-year-old Dutch Shepherd, donated to the department," the Facebook post read. "A huge thank you to Furlife German Shepherd Rescue for making all of this possible," the post continued.